I’ve lived in Houston since 1957 and have known about Phillis Wheatley high school all that time, but I’ve never known about the woman for whom the school is named. As I was researching female authors, I saw her name and immediately knew it had to be the same woman because of the unusual spelling of her first name. Further research revealed a fascinating story I decided to share. She was born in Senegal about 1753. As a child in 1761, she was kidnapped and brought to Massachusetts on a slave ship and purchased by John Wheatley as a personal servant to his wife. 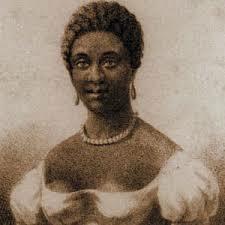 Susanna Wheatley took Phillis under her wing and, unlike many other slave owners, John and Susanna made sure Phillis was educated and her quick mind helped her to master both Latin and Greek and to write poetry. She also studied English, theology, ancient history, and literature. At a time when most slaves were discouraged from or even prohibited from learning to read and write, Phillis was an anomaly. She began writing poetry at the age of thirteen. Susanna was impressed by Phillis’ way with words and encouraged her to write more. 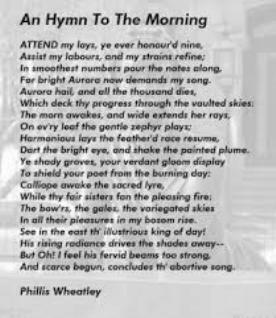 In 1773, when Phillis was about twenty years of age, she gained stature as a published poet when her book of verse, Poems on Various Subjects, Religious and Moral, was published. 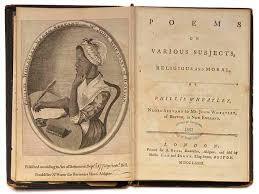 As proof that she had actually written the poems, seventeen Boston men were included in a preface stating that fact. Among them was John Hancock. Her book of poetry was a landmark achievement. In doing so, she became the first African American and first U.S. slave to publish a book of poems as well as only the third woman to ever do so. However, it did not come easily. After the colonists were unwilling to support literature by an African, she and the Wheatleys turned in frustration to London for a publisher. A wealthy supporter of evangelical and abolitionist movements, Countess of Huntingdon, aided in getting the work published. Several of Phillis’ poems were written in honor of George Washington, and she even sent one to him. That garnered an invitation to visit the commander at his headquarters in Cambridge, Massachusetts which she did in March of 1776. Phillis battled health issues later in life and went to London where she found medical treatment for her asthma.. When she returned to Boston, her life changed significantly with the deaths of Susanna and John. She was them freed from slavery and in 1778 married a free African American, John Peters. They had three children, all of whom died in infancy. John and Phillis endured many hardships and constantly battled poverty. She was forced to find work as a maid. She continued to write, but her enthusiasm had waned because of her hard life. She never found the publishing support she needed for a second volume of poetry. Phillis Wheatley Brown , a woman who had been honored and respected in the presence of the wise and good, died in abject misery in squalid poverty on December 5, 1784. A sculpture of her is included as part of the Boston Women’s Memorial which was established to honor important contributors to Boston’s rich and vibrant history. It was created from the only image they had of the young woman and depicts her as contemplating her next poem. Although her life was short and far from easy, Phillis Wheatley made an impact on Colonial America that has not been forgotten. Below is one of her poems. The original Phillis Wheatley high school in Houston was formed in 1927 when students moved into the old McGowan Elementary School on Lyons St. In 1949, the school opened a new campus because the first had become too crowded. Then in 2006 they moved into a much larger and more modern campus. Below are the high schools. Although her life was short and far from easy, Phillis Wheatley made an impact on Colonial America that has not been forgotten. I'm glad to know more about the woman for whom the high school was named. Martha Rogers is a free-lance writer and multi-published author from Realms Fiction of Charisma Media and Winged Publications. She was named Writer of the Year at the Texas Christian Writers Conference in 2009. She is a member of ACFW and writes the weekly Verse of the Week for the ACFW Loop. ACFW awarded her the Volunteer of the Year in 2014. Her first electronic series from Winged Publications, Love in the Bayou City of Texas, debuted in the spring of 2016. 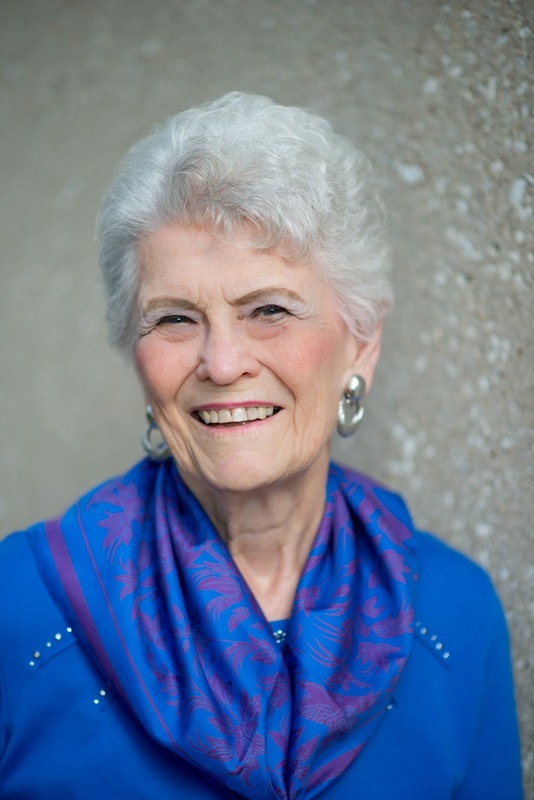 Martha is a frequent speaker for writing workshops and the Texas Christian Writers Conference. She is a retired teacher and lives in Houston with her husband, Rex. Their favorite pastime is spending time with their eleven grandchildren and four great-grandchildren. 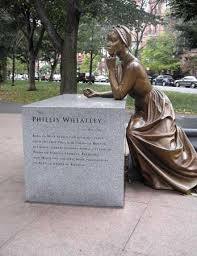 Martha, thank you for sharing about Phillis Wheatley. A very interesting post that tugged at my heart with all she endured during her life. It tugged at mine too, and I wonder how many others in Houston have no idea who she is. A beautiful high school, but what a history for the name on it. Thanks for stopping by. Thanks for this reminder of a brilliant young woman. I hope to meet her one day in heaven. So true, Stephanie. What a great reunion is ahead because there will be no time limit on finding people we want to see again. Thank you for your interesting post, Martha. It is always nice to know the background of a person when you see their name on a building. It's so weird because I've seen her name and heard it for nearly 60 years and never even thought about who she was. Thanks for stopping by. What a great story. So, did the Wheatley's adopt her or just let her use their name? Thanks for sharing. Back in the days of slave trade, the slaves took on the name of the family owning them. They were very liberal in their treatment of slaves or she would never have learned to read and write. Such a sad story! Thanks for sharing. I've come across Phillis' work and picture in my research of the period, but I didn't know most of her story until now. There is a Phillis Wheatley Center here in Greenville, SC. I always assumed it was named after some local person. Thanks for sharing about Phillis.